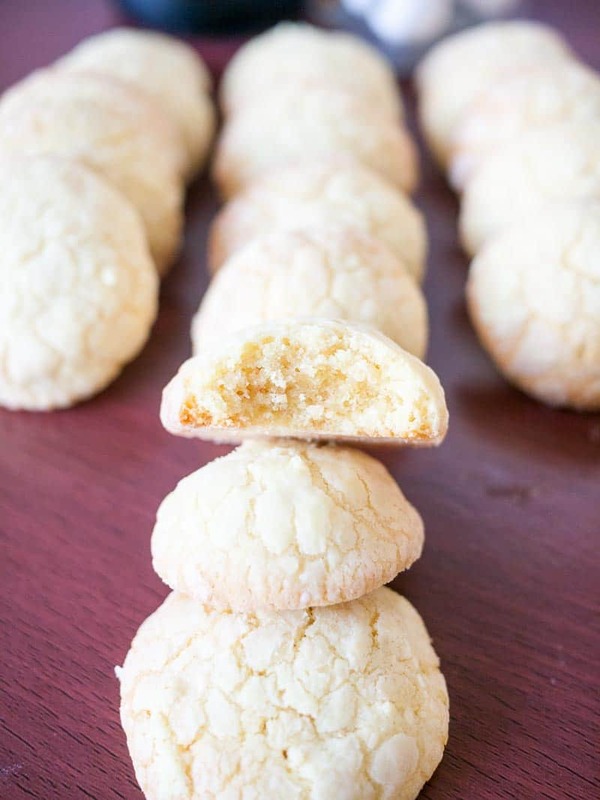 A butter cookie that melts in the mouth with the rich flavor of fresh lemon zest and juice. 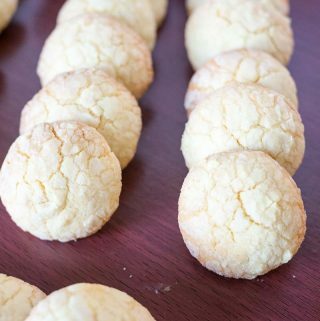 This simple, easy and effortless recipe for lemon butter cookies is as easy as a cookie recipe can get. Takes no special skills, techniques or tools and gets done in less than half an hour. There was a time when I would frown at the thought of lemon in my cookies. I do love lemon and I can eat lemon curd from a jar with a spoon. And yet, somehow the idea of cookies and lemon flavor did not go well until one day I tasted these. I had them in Amsterdam and they were served with a Lemon Mousse! I know!! Not really what I would serve with my lemon mousse but I must admit it did go well together. That day, I decided I would make lemon cookies. 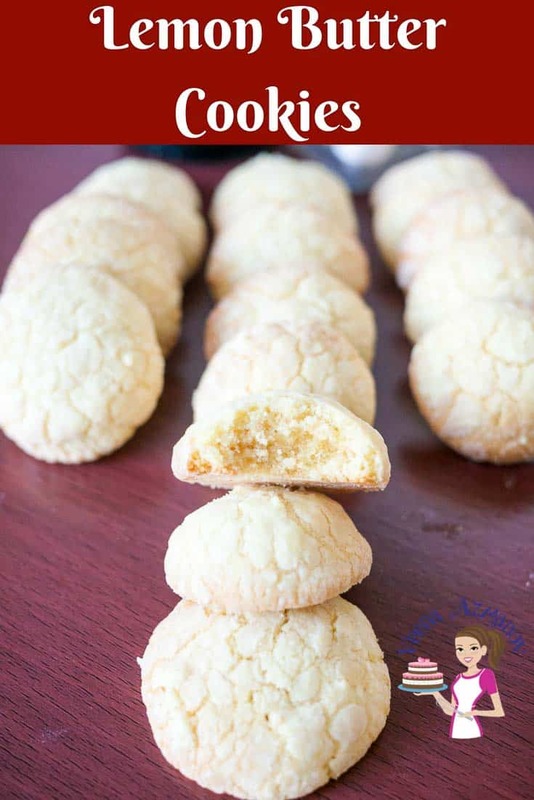 I tried a few good recipes over the years but there is something about my butter cookies that just go so well with the lemon flavor. You have to try it to know what I mean. 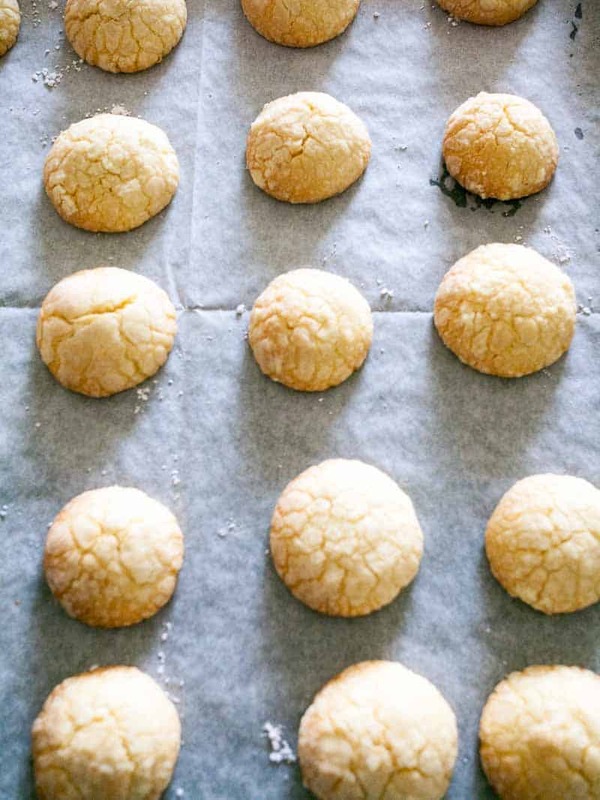 I honestly didn’t’ know what better to name them than simply to call them what I know – lemon butter cookies. Because they are a variation of my butter cookies. So, I hope you like the name and I do hope you try these delicious cookies. Powder sugar – I love the texture that powder sugar brings to this cookie. You can use regular sugar but the cookies will spread more and it will not be the same cookie. Semolina – this adds a little of that bite and body to the cookie. It gives it that crumble in the mouthfeel. If you don’t have semolina you can use cornstarch aka cornflour instead. Egg yolk – sounds like a little but that’s all you need. It’s just a right amount to prevent it from spreading. If you must substitute the egg you can try adding two tablespoons of greek yogurt instead. Lemon – since it’s a cookie we can only add that much of liquid so the zest and extract do go a long way in adding flavor. 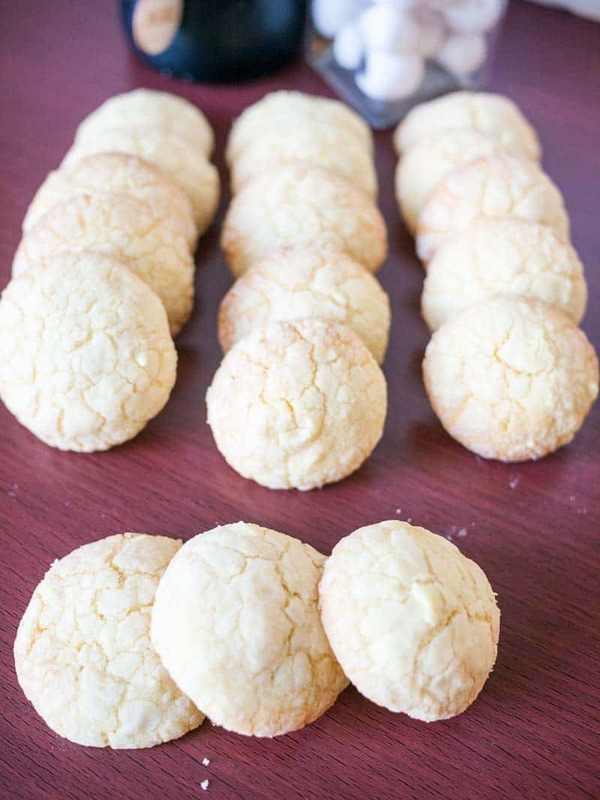 Food color – oh you can totally omit it but these are lemon cookies which we associate with the color yellow – unfortunately no amount of lemon juice is going to give you that so it’s a drop of yellow food color or white lemon butter cookies. You choose. I choose to add just a drop. Also, it is really important to cool cookies completely on all sides as soon as they come out of the oven. So take them off the baking tray to prevent them cooking further and place them on an Cooking rack so they air circulates on all sides. This prevents steam from going back into the cookie thus…… keeping them crispy not soggy. 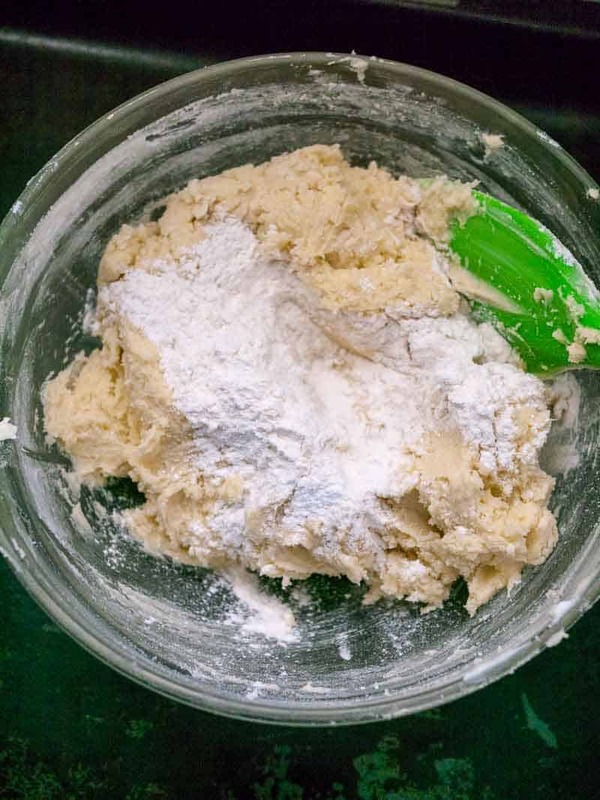 Combine together the flour, semolina, baking powder, and salt. 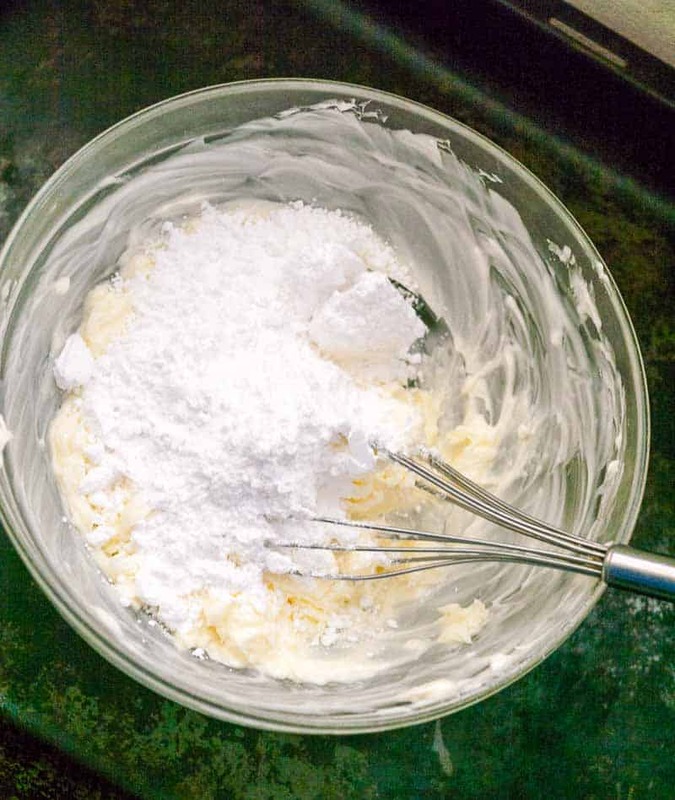 Lightly cream together butter and powdered sugar. 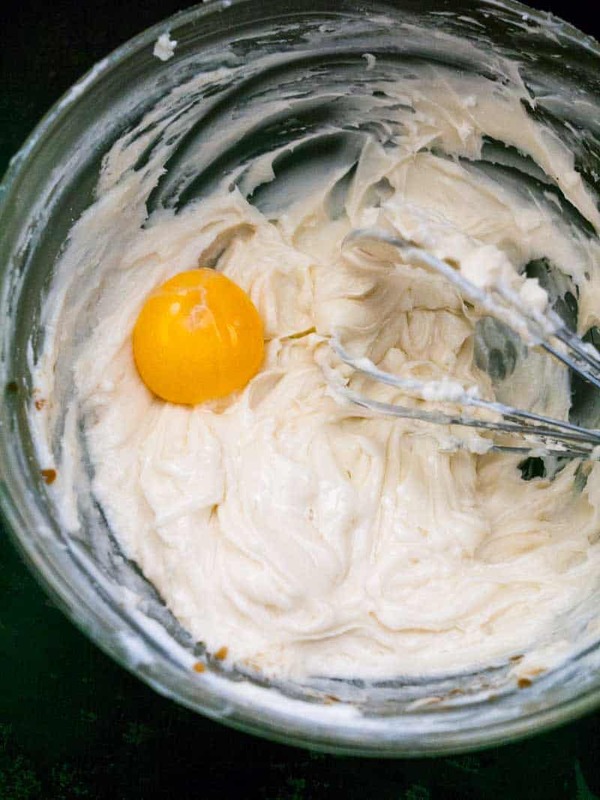 Add the egg yolk, lemon juice, zest, and food color if using – combine well. Lastly, add the lemon extract. Gather into a ball, wrap in a plastic wrap. Chill dough for 15 to 20 minutes until firm. Preheat the oven to 180 C / 360 F.
Roll small portions of chilled dough into balls with your hands. Place on a cookie tray. Bake in a preheated oven on the middle shelf. 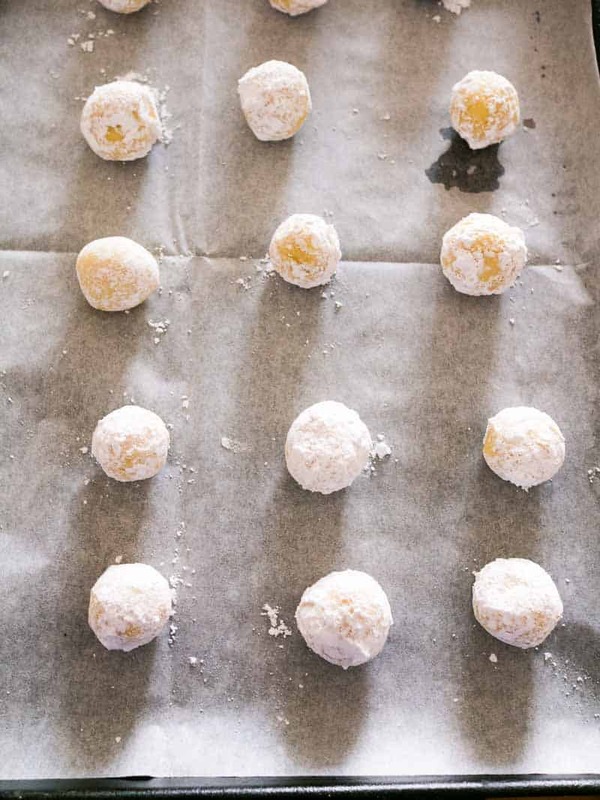 Depending on the size of your cookies and the oven they take – 8 to 10 minutes. Mine took 8 minutes – watch the sides – a slight color on the sides is all it needs. Cool on a wire rack before you store them in a cookie jar. These will stay good for about 2 weeks but. Taste their best in the first week of baking. The dough freezes beautifully for up to six months. The cookies keep well frozen too! Add the egg yolk, lemon juice, zest, and food color if using - combine well. Depending on the size of your cookies and the oven they take - 8 to 10 minutes. Mine took 8 minutes - watch the sides - a slight color on the sides is all it needs. These will stay good for about 2 weeks. But they taste their best in the first week of baking. The picture alone is making my mouth water. They look so delicious ! Thanks, Stephanie. Yes, they do have that same texture on the outside. These looks fantastic. I love lemon flavors in dessert, and cookies are always perfect for summer entertaining! Absolutely, Sara. Love lemon anything really. Lemon is one of my favorite flavors – equally perfect in summer and winter. Love good soft cookies like these! I have a favorite lemon sugar cookie recipe that I maoe a few times a year. I can’t tell you how many times I wanted a butter cookie and this one hits the spot! Thank you, Jessica. I love butter cookies and this one with lemon tend to just hit the spot for me too. These cookies look incredible. I love lemon desserts and this one is on the top of my to make list. It looks so buttery and soft. I can easily see myself having about a dozen just to myself. I’m one of those that loves lemon on almost everything! So a lemon butter cookie is right up my alley! They look absolutely delicious and so easy to make! Thanks Femi. Yes, I love lemon everything. These just melt in the mouth. 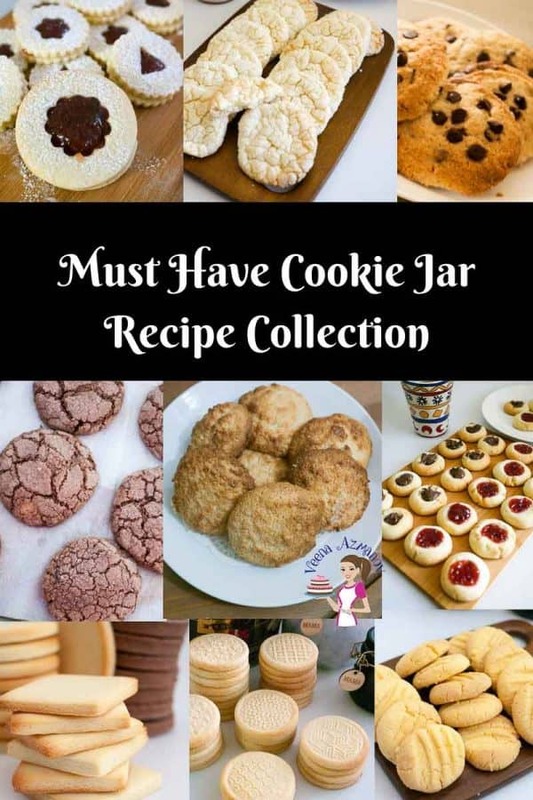 I just love these kind of simple and amazingly flavorful cookies.These would be so delicious with my tea. Thank you, Prasanna. I know what you mean. I love such cookies too. Lemon flavored treats are a favorite in our house! 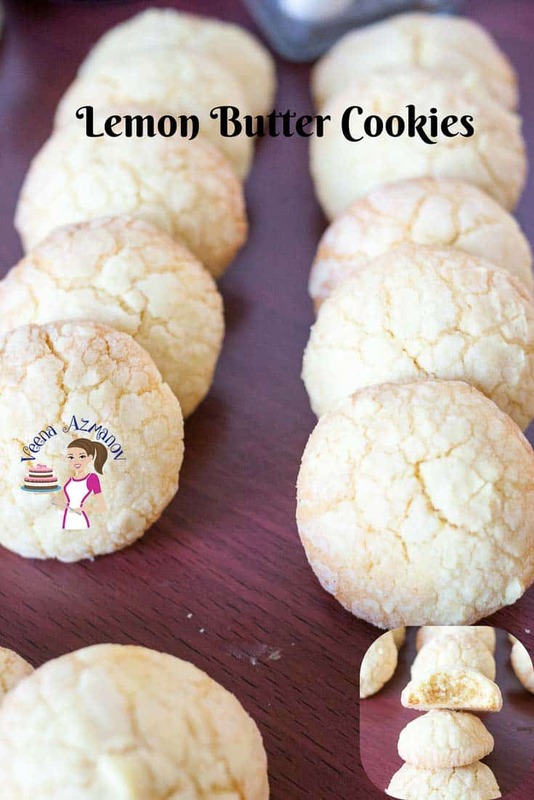 I know we would all enjoy these lemon butter cookies! Absolutely Meredith. I love lemon too. These would be perfect as an afternoon summer treat. I’d wash them down with iced tea or lemonade on the porch! Thank you Kitty. Absolutely – perfect flavor for summer. These lemon cookies look so delicious! I would love to have a couple right now with my cuppa! Thank you for sharing! Thank you, Anna. I’m sure you would enjoy them. These lemon cookies had just the right texture… crunchy on the outside, but still tender and wonderful on the inside! Thank you Michele. Yes, they are just the right texture of soft on the inside. These look great! And super straightforward to make… will definitely add these to my to-make list! Thanks Kelli. Yes, they are super easy and simple. Veena Azmanov, thank you ever so for you post.Much thanks again. Mmmm! Yum! I love lemon cookies. I have never made them myself, though. I can’t wait to try your recipe!What a great summery cookie. Thanks Kate. You must try, they are super simple. These cookies are perfect for nibbling on a terrace this summer with a cup of cold milk. I bet my kiddo will love them. Lemon makes any dessert so refreshing and light. Delicious! Absolutely Natalie. I love cookies and milk. I bet the kids will love it too. Lemon is the favorite in our house in everything no matter what I cook or bake. Everyone loves lemon cookies and butter cookies sound so decadent. I think I need to surprise my husband with these tonight. 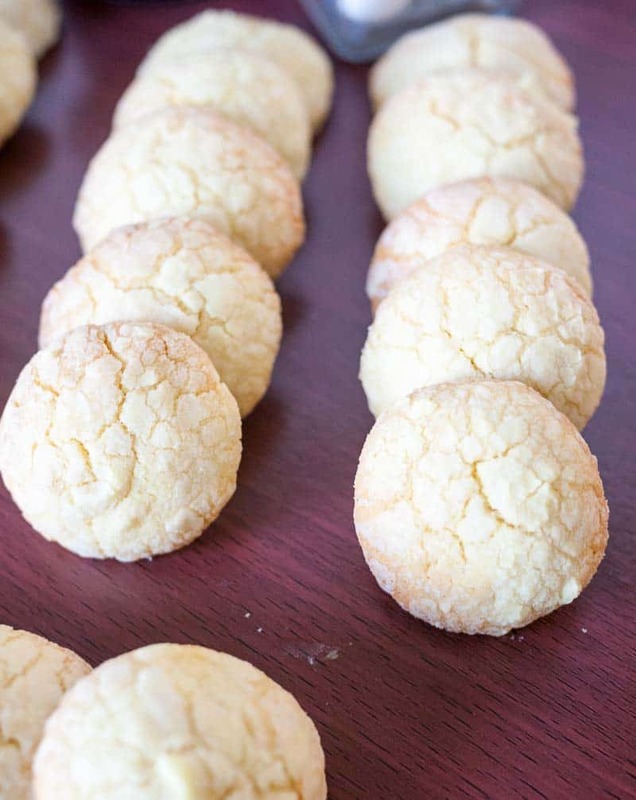 He will be surprised I have always made Italian lemon drop cookies but these sound fabulous! Aww I hope you try them Claudi. These just melt in the mouth. I’m sure he will love them. Such beautiful cookies! I love those crinkles. Perfect for pairing with afternoon tea. Thank you, Tara. Me too love those crinkles on the top. I love lemon desserts, especially for spring! This cookie is like a little ray of sunshine! Me too Demeter. Love lemon cookies too! Thank you Wajeeha. I do hope you try them – super delish. I absolutely love any kind of lemon desserts. These sound amazing!